The October Revolution: A Beacon for Americans Today. Contribution of the Party of Communists, USA (PCUSA) at the Scientific Conference in honor of the 100 years since the October Revolution. This year we celebrate the 100th anniversary of the socialist revolution in Russia. It was the first time that the working class anywhere in the world was able to seize and hold power. The revolution grew out of the conditions of imperialism and the First World War. Russia had been ruled by a tsar, or emperor, making it one of the most reactionary regimes in Europe. In the 1930’s, when the entire capitalist world sank into depression, and tens of millions were left jobless and starving (much like today), the Soviet Union was forging ahead building a new society without unemployment and hunger. They transformed a country with a 90% illiteracy rate into one in which nearly everyone could read and write. Under the Bolsheviks the last serfs of Europe were freed and the country was transformed into a modern, industrialized socialist state. The prison house of nations became the community of nations. The Soviet Constitution abolished racism and every man and woman were guaranteed the right to work, A 40-hour work week, social security, housing, food, education, and medical care were the law. Child labor was abolished; Homosexuality was decriminalized; and Women for the first time were granted the right to vote, hold office, and were paid the same wages as men. Influence Abroad: The West Invaded and later Pushed “Reforms” to forestall Revolution. Fearing the spread of Soviet socialist revolution, Winston Churchill remarked, “We have to strangle the baby in the cradle.” Thus in 1918, an Expeditionary Force consisting of 17 nations and 22 legions invaded the young Soviet Union. It was during this war that the British army first used chemical weapons in battle. Over 8 million people were killed, but the Soviets defended their revolution and the invaders were expelled by 1921. The benefits of the Bolshevik Revolution were not limited to Russia alone. The 40-hour work week, minimum wage, social security, abolition of child labor, free education, the right to clean water, and many other concessions that Americans now take for granted are a by-product of socialism. President Roosevelt did not “give” these concessions. It was the militancy of workers led by a young, militant American communist party who were inspired by the example of their Russian comrades. The Soviet Union Rescues the World from Nazism. When Mussolini, Hitler, and the rest of the Fascists unleased war upon the world, it was the Soviet Union that bore the brunt of the attack. The battle of Stalingrad was the turning point of the Second World War. The total number of Soviet lives lost exceeded 22 million. The accomplishments of building socialism and defeating fascism are a tribute to the leadership of the Communist Party and its General Secretary Joseph Stalin. Communists are reviled by anti-communist “historians” in the pay of world capitalism for this reason. During the post-war period, the Soviet Union became a beacon for workers in the West that demanded greater concessions from their capitalist masters. The USSR with its policy of proletarian internationalism, provided a shining example to national liberation movements throughout; Africa, Asia, and Latin America. To destroy the Allied alliance which included the Soviet Union, finance capital replaced Henry Wallace with Harry Truman on the Democratic Party ticket in 1944. Truman became President when President Roosevelt died. The Truman administration started the Cold War, which began with the first use of nuclear weapons that were dropped on civilian centers in Hiroshima and Nagasaki, Japan. It was Karl Marx who said we should “question everything.” It was Lenin that pointed out in history we must view everything from a class viewpoint; who benefits from capitalist policy? The Capitalist-owned mass media began a propaganda war falsifying history against the Soviets and their allies, concealing their true motives for dropping those nuclear bombs on Japan. Western Capitalists spent trillions of dollars over many decades trying to defeat socialism militarily. Unable to defeat the USSR with an escalating arms race, the Western powers funded a counter-revolution inside the country led by Mikhail Gorbachev and other traitors. The Soviet Union did not collapse. She was betrayed by paid anti-communist forces within Russia. We know from our study of history that the return of capitalism to the USSR is a temporary historical setback. Without the USSR and a strong world communist movement to act as a brake on capital, we live in an era of widening imperialist wars, fascist attacks on the working class, mass unemployment, drug addiction, diseases like AIDS and Hepatitis C killing millions. Our movement is daily studying to learn from the Soviet Union’s great battles and achievements as well as the human errors that led to her deliberate destruction. The main lesson we learned from the tragic collapse of the USSR is that reformism and concessions to capitalism only lead workers to defeat, and a life of poverty and insecurity. We honor the bold fight by the workers and peasants in the Bolshevik Revolution against capitalism and for a working-class socialist world. Today, we must organize workers, students and soldiers in the USA to build a mass working class Party that will turn this era of imperialism into a new, higher stage of human development called socialism. From our historic viewpoint, the Soviet experiment was not a failure. It was a successful first step towards building a scientific socialist society. Its success can be measured by the economic reforms that workers in the US and the West have today. It’s no accident that the quality of life for workers in capitalist countries has deteriorated substantially since 1992, the year the USSR went out of existence. 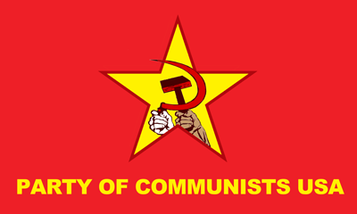 The success of national liberation movements in China, Vietnam, DPRK (North Korea), Cuba, Zimbabwe, South Africa, Mozambique, and Angola to be free of colonial oppression are a direct result of the Leninist policy of Soviet proletarian internationalism. Let us be inspired by the shining example of October to create a new, socialist-communist world free of all exploitation and imperialist war! 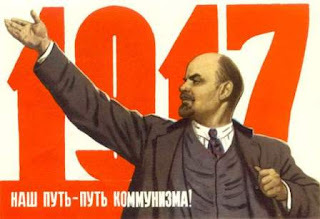 Long live the example of the 1917 Revolution! Peace, land, bread! We Communists have been peace activists all our political lives. That is why we find life today so troubling. The two USA parties of monopoly capitalism, the Democrats and Republicans, worship war and military spending. Along the way, they corrupt the minds of workers and promote hatred among peoples. It has been suggested that the leaders of these parties are addicts, that they are addicted to war. The truth is that the capitalist economic and social system that these parties represent cannot exist without war and conquest. We founded the PCUSA in 2014 precisely because we saw the urgent need to build a strong Communist movement in the United States that would not tap dance around the peace issue. We need a fearless voice to represent the working class on the peace question. This is the job of every Communist.